NALCTP will dramatically increase the demand for lighting controls in commercial buildings. At the program’s core is a rigorous, comprehensive course developed by the University of California-Davis’ California Lighting Technology Center. The training regimen is composed of 10 hours of prerequisite study material, followed by 10 hours of lecture, plus 40 hours of hands-on lab work. NALCTP certified electricians have an unparalleled advantaged installing this growing technology. Because the lecture and lab work moves along at a challenging pace, all participants must be equally prepared prior to enrollment. The prerequisite studies are on the Lighting Controls Association website—modules EE101, EE102 Part 1, EE103, and EE201 (Approximately 10 hours). These courses can be found here. For enrollment in NALCTP, applicants must present a certificate of completion for online study to enroll in the NALCTP course. 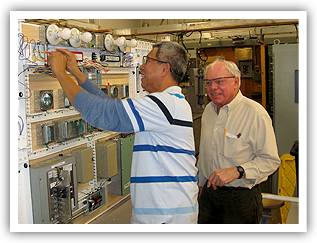 The corresponding lab period, following the lecture, allows the attendee to directly apply what has been learned by installing the devices on electrical lab board, under the supervision of the NALCTP-certified instructor(s). The four online courses required prior to enrollment are available on the Lighting Controls Association website.These courses can be found here. NALCTP has taught me how to properly install advanced lighting controls. Having the knowledge was critical to my company winning and installing Lutron QS system at Brookfield Properties Landmark Square Building,” said Mike Goodwin, project manager at M.B. Herzog Electric. “With this knowledge, M. B. Herzog Electric is more confident bidding advanced lighting controls jobs.